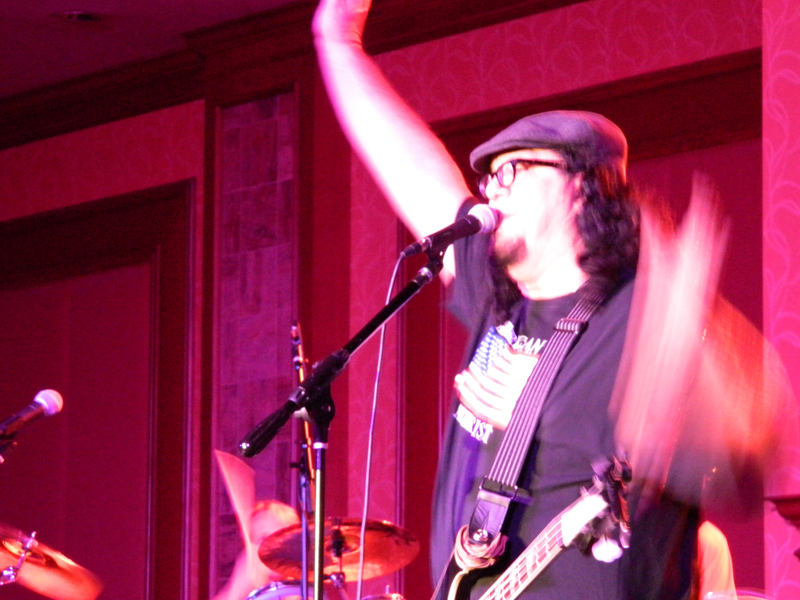 I’ve attended both of the “Bacon and Donut” parties thrown by Penn Jillette. Penn throws the party as a fundraiser for the JREF. While not officially associated with The Amazing Meeting, the Bacon and Donut party has become a part of my visit to South Point that I really look forward to. I own a much smaller version of this poster that is on my dining room wall. Only regret, it’s not signed by Penn or Heather! Travis and Dale Roy are all smiles. Basically, the title says it all. You have bacon and donuts. 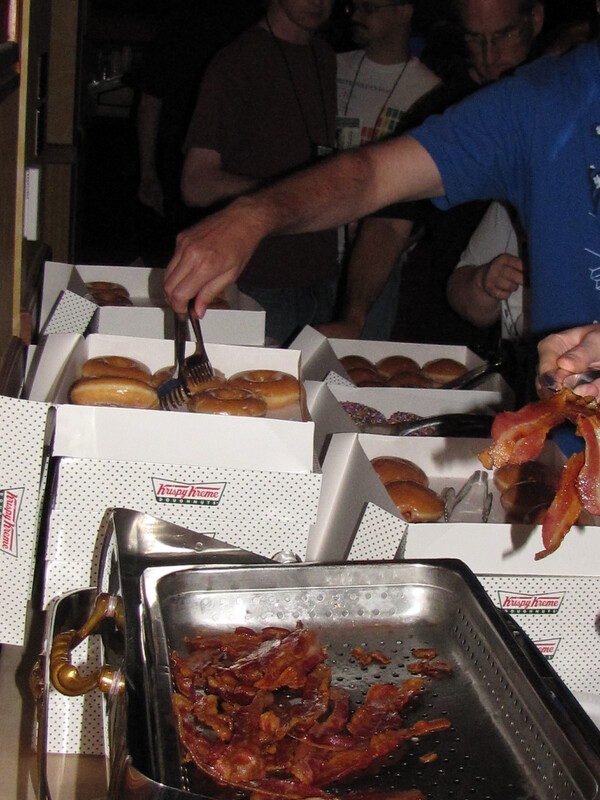 The bacon and donuts are donated, and I admit to making a sandwich of two donuts with bacon in the middle. It’s about as bad as I get in Vegas. What happens in Vegas, stays on your arteries. What more does anyone need than bacon and donuts? Besides excellent food, there is music. The “No God Band” with a lead singer that might not want to give up his night job as a magician, is fabulous. Heather Henderson is a singer and performer not to be missed, and throw in my good friend Caroline Gayle dancing and it’s an evening that is unforgettable. I join in dancing and even singing, and even though the evening is late I just eat another bacon and donut sandwich to keep me going! 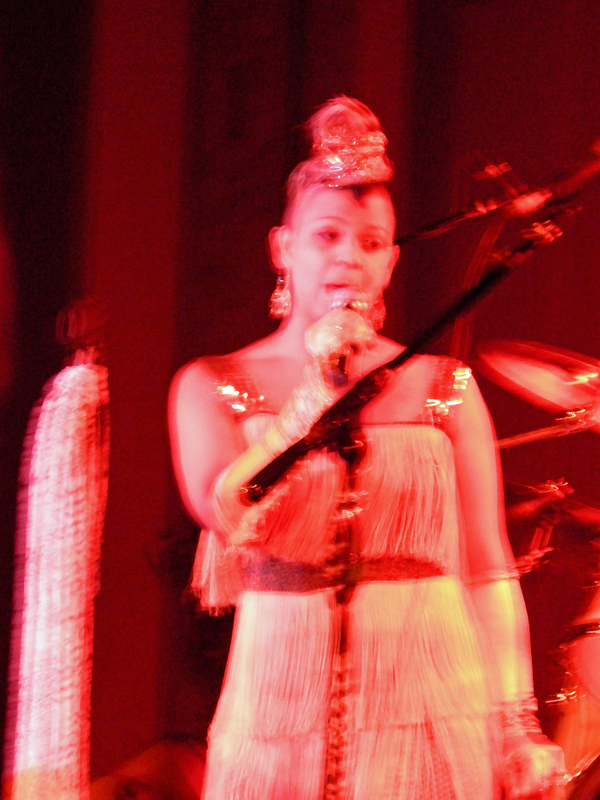 This singer isn’t too bad…. The first year, I bought a T-shirt, which I love wearing (it’s getting a bit too worn), and I also own a small copy of the poster designed for the event. It hangs in a place of pride right over my dining room table! Sometimes people do a double take “What is the No God Band?” is asked. I say “They are wonderful! They are my favorite band as they make Mr.Randi smile!” I love how the band always plays at least one song as a homage to Randi. The Bacon and Donut party is just people of all ages, and all manner of dress from jeans to party dresses, just having one hell of a good time. Donations to the JREF are appreciated. If you go and don’t want to make a donation, just don’t come! It’s all for the love of Randi and the JREF. I can’t wait to attend this year. I’ll pay for it in the morning, but that’s what why coffee was invented. It should be noted, I love this couple. It’s just part of the fun that is this party. Dress as you want, dance as you want, just be sure to donate! 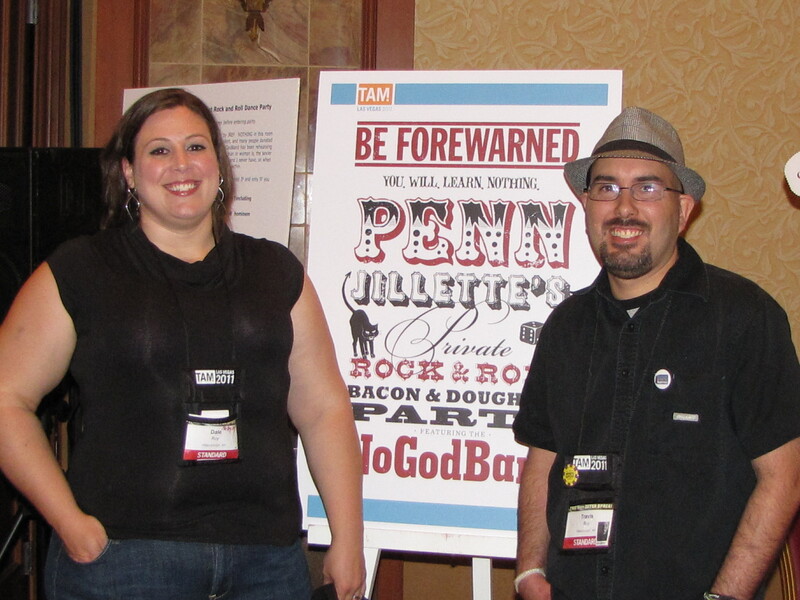 Also, give Penn a big thank you for throwing a fun party, that benefits Randi and the JREF! It is a great party. Fun for all. Bacon & donuts are too delicious. I look forward to this year’s bash.